Natalie Prince, RN, a staff nurse on the Cardiovascular Surgery Floor, was recently named the March DAISY Award recipient for McLeod Regional Medical Center. Prince was nominated by a patient’s son for her extraordinary care and compassion. 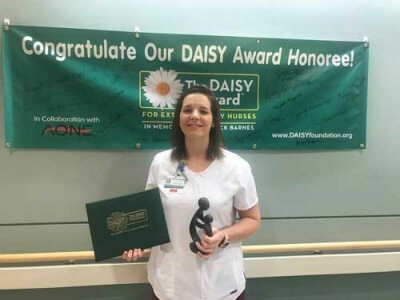 To recognize those nurses at McLeod Regional Medical Center who are true examples of nursing excellence, patients, family members and co-workers may nominate nurses for the DAISY Award for Extraordinary Nurses. The award is part of the DAISY Foundation's program to recognize the super-human efforts nurses perform every day. Nurses may be nominated for their strong clinical skills and the compassionate care they provide. Nomination forms are available on each nursing unit at McLeod Regional Medical Center or can be found at www. McLeodNursing.org. Recipients of the DAISY Award are chosen by the DAISY committee, led by nurses at McLeod Regional Medical Center. Awards are given throughout the year at presentations in front of the nurse’s colleagues, physicians, patients, and visitors. Each honoree receives a certificate commending her or him for being an “Extraordinary Nurse.” The certificate reads: “In deep appreciation of all you do, who you are, and the incredibly meaningful difference you make in the lives of so many people.” The honoree is also given a beautiful and meaningful sculpture called “A Healer’s Touch,” hand-carved by artists of the Shona Tribe in Africa.